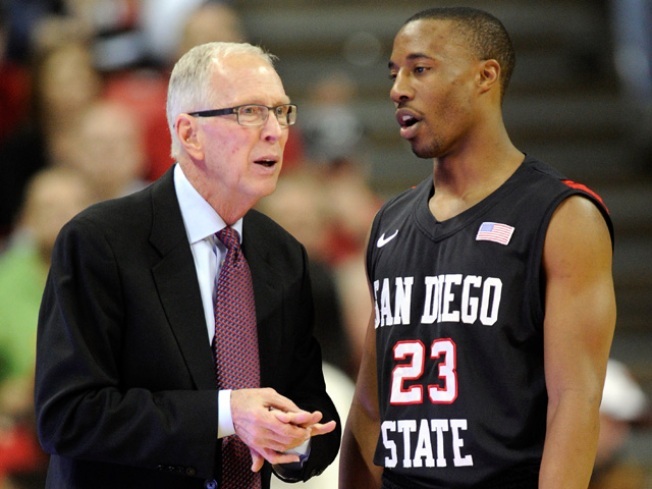 Head coach Steve Fisher of the San Diego State Aztecs talks to D.J. Gay #23 during the team's game against the UNLV Rebels at the Thomas & Mack Center February 12, 2011 in Las Vegas, Nevada. San Diego State won 63-57. Third time proved to be the charm for No. 7 San Diego State as they beat No. 8 BYU Saturday for the Mountain West Conference Tournament championship 72-54. Students rushed the floor chanting and cheering after the win. For the Aztecs, the win is the second straight MWC championship and puts great cap to a 32-2 season. "We played hard three straight games. I think our defense allowed us a great offense and they didn't shoot it the way they shot it for two games," said head coach Steve Fisher immediately after the game. Cutting down the net was pretty special for the team said Fisher. Aztec forward Billy White scored 21 points with 12 rebounds, his third career double-double. "I just want to thank my teammates for giving me the ball, I couldn't do it without them," said White. "I just want to play with a passion," he said. And passion he did. His five steals set the tone for the game. SDSU held BYU to only 32.2% shooting according game officials. As for the team that proved to be their toughest opponent all year, White said the team wanted this win badly. "This means a lot to mean and my teammates. We wanted it real bad and we got it," he said. After the celebration, the team will prepare for Selection Sunday as they wait to see if they get Tucson or Denver in the NCAA Tournament. Led by Jimmer Fredette \, the Cougars (31-3) had the number of the otherwise perfect Aztecs this season, but that would not hold true Saturday. The game marked the first time BYU was matched up against San Diego State’s athletic frontcourt — headlined by sophomore Kawhi Leonard (15.3 points, 10.8 rebounds) — without top interior presence Brandon Davies. Davies was suspended for the season due to a violation of university rules. Point guard D.J. Gay hit a one-handed floater Friday night with 4.9 seconds remaining to life San Diego State to a 74-72 win over tournament host UNLV.